I need this tree next week can you get it done that fast? Can I order a color that isn't on the order form? Which order form should I fill out for my family names? Can I add siblings of the trunk couple on my ancestry tree? Can I use just first names? I have 75+ family names, can you make a tree that big? Should I include the birth and marriage dates? There is a divorce in my family--how will that be shown on the tree? How do I show a divorce on the names form? I have an iPhone or iPad, how can I fill out the names spreadsheet? Will I be able to review or make changes to the tree before it's printed? I'm using a phone or tablet (iPad), and can't upload the names file. Can I ship it to a different address than mine? My print was damaged in the mail, can I get a new one? I need to add a name to a tree I previously ordered. How do I make changes? Need some help? Peruse the questions and answers below, if you still need help, feel free to contact us. Click here to start a new order or navigate to "Order" at the top of this page and start filling out the form. If you have any questions, feel free to contact us. The actual time from start to finish can vary greatly depending on the amount of orders currently on the design queue and how much time you take during the approval process. While an order may take significantly less time to complete, it is best to allow a minimum of 2 1/2 to 3 weeks total turnaround time. Orders are placed on the queue and finished in the order they are received and paid for. You will receive an estimated start date for your tree after we receive your payment*. Once it is your turn on the queue, it will only take 1-3 days for the tree to be made. Allow more time for larger trees. A sample tree to proof will be emailed to you to look over. It typically takes approximately 1-3 days for sample to be looked over; the longer you take to approve the sample, the longer it takes to get the final product. Since communication between you and the designer is done through email, responding quickly to emails will greatly decrease turn-around time for your tree. Look over the sample carefully the first time to catch all mistakes and decrease the turnaround time. The designer will return a new sample to you for proofing each time any changes are made until the tree is completely approved and ready for printing. Allow an additional 2-4 days for printing, packaging and being put in the mail. Our family trees are shipped USPS Priority Mail. Most trees are received anywhere from 2-5 days after they are shipped depending on location and time of year. It may take longer to receive an order during the Christmas Season. *If you have a fast approaching deadline please discuss it with us in an email; you may need to pay a rush fee ($25) to bump your name to earlier in the queue in order to receive your tree on time. Orders are placed on a queue and finished in order they are received and paid for. If you have a fast approaching deadline please discuss it with us in an email; you may need to pay a rush fee ($25) to bump your name to earlier in the queue in order to receive your tree on time. It is also important to pay attention to special holiday deadlines, to avoid paying fees around those times. Absolutely! We welcome your creative ideas for colors that you may want to make your tree special. You may request any color background that you may want, just select the 'Special Request' option while filling out the form and write in how you'd like it to look. We we will work with you to find just the right look. We create two types of trees--Present Day and Ancestry. The information you have and who you want to feature in the main part of the tree will determine which type of tree and coordinating form you should fill out. Present Day Tree - The trunk may feature an individual or a couple. The branches are the children, grandchildren and great grandchildren of the couple or individual on the trunk. Ancestry Tree - The trunk may feature an individual or a couple. The branches consist of parents, grandparents, and great grandparents. An Ancestry tree typically consists of a couple for the trunk, their parents, and their grandparents, etc. Sometimes roots are added to include the trunk couple's children. Due to the nature of the design of this type of tree there is not a good placement for the siblings of the trunk couple. It is recommended that you use at least first and middle names or first and last names for a good branch length. However, depending on the number of names, your tree may still look good using only first names. Yes! We have made trees with over 100 branches. Our basic design fee covers the trunk and up to 30 branches on the tree. After 30 branches, each additional branch costs $1. It is recommended to get the 16x20 print size or request an even bigger size so that all the names are still big enough to read. We will work with you to determine the right size to order if you have a very large family. 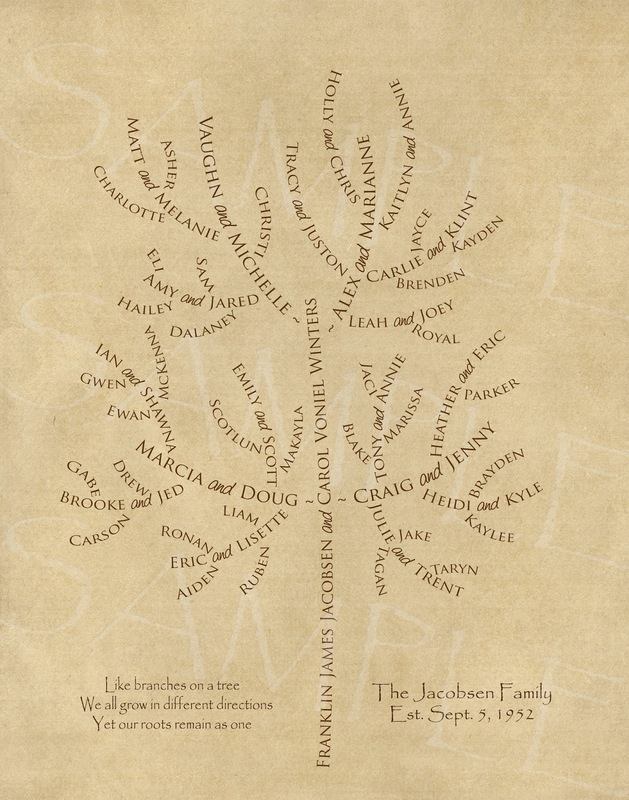 Sometimes a tree doesn't have a lot of names or branches, so marriage and birthdays are added to help fill out a smaller tree. Other times, a family just wants to include more family data on their tree, so they include the dates. It is a personal choice, but do consider that an average to larger sized tree may look more cluttered with added dates and detract from the look of the tree. Leaves can also help fill out a smaller tree. 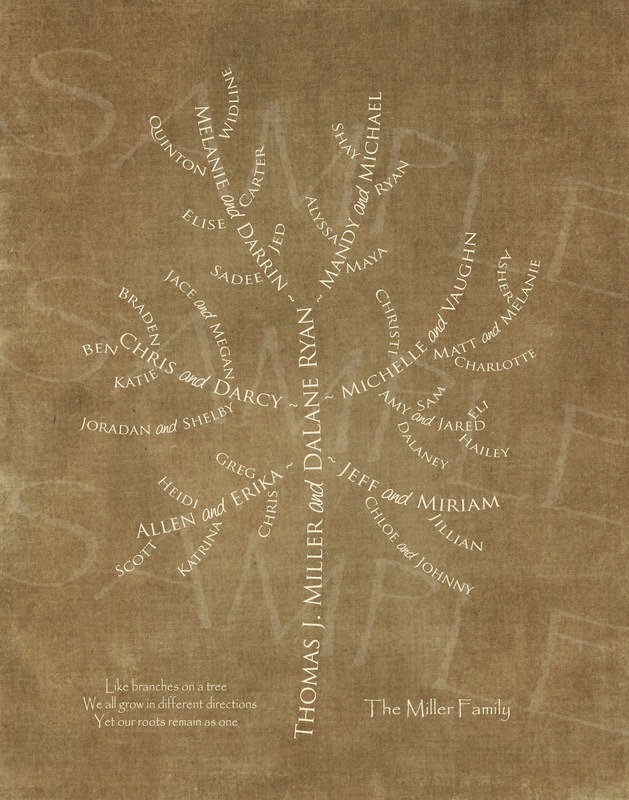 Due to the nature of the design, an Ancestry tree cannot include marriage dates. It can still, however, include birth or even death dates. 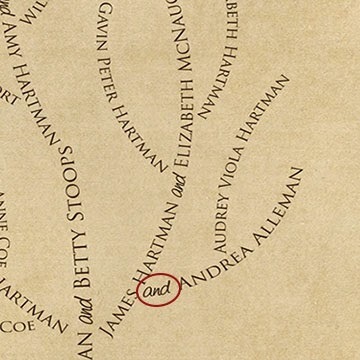 It is a personal choice whether or not the divorced spouse is shown on the tree. They may be left off if it would offend feelings in the family. If you choose to include them they will still be shown with an "and" to distinguish them from any children, but the branch will not be inline directly with the family member on the tree to show the divorce. This image shows the correct way to show a divorce on the names form. The divorced spouse (ex. Mary) is written in the box below the family member with the "divorced" next to their name. If the family member has remarried, the current spouse (ex. Alison) should be in the same box on the same line as the family member. Any children in the family should clearly be labeled to the parents they belong to. In the example the first child belongs to Gary and Mary (the divorced spouse) and the other two children belong to Gary and his current spouse, Alison. We recommend installing the "Numbers" application for iOS. It is a free app that you can find on the app store. After you download either the Present Day or Ancestry names file, you should see a link to "Open in Numbers" at the top of the document. Click on that link. Once you fill out this form with your family names, you can then share this file by clicking on the top right corner on the "Share" icon. Select to send a copy via Email, and select the "Excel" version. Send the email to makemybranches@gmail.com. After your order has been submitted, you will get a chance to review your order to make sure it's exactly how you'd like it. This is your opportunity to work with the designer to change and tweak things on the tree to make the tree perfect. After you approve the sample, no changes can be made without paying additional fees. Some mobile phones and tables (iPhone and iPad included) can't upload spreadsheets online. In that case, feel free to submit the order using the website without uploading a file, and email the completed form to makemybranches@gmail.com later. When you are ready to create your family tree, create a new order and begin filling out your order forms. Enter your Gift Certificate code in the Promotional Code box to receive your discount. You may ship it anywhere in the United States that you would like. We only ask for the address that the prints will be shipped to, so if this address is different than your home address please give us the correct address from the start. If you need to change it later, you may email us the change. Unfortunately we do not ship internationally right now, however you can still order a tree and purchase a digital copy which you can print anywhere you'd like. Additional fees may apply. We use PayPal as a means for a safe transaction. You do not need a PayPal account to pay using PayPal. In the emailed invoice that comes from PayPal, follow the instructions to the payment page. Instead of logging in to PayPal, look for the link to click on that says either "Don't have a PayPal Account?" or "Pay with debit or credit card, or Bill Me Later." This will allow you to enter your payment information without logging in to or needing a PayPal account. 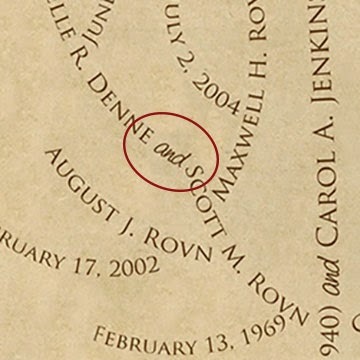 We do our best to create a beautiful piece of artwork using your family names, but we understand that sometimes a situation causes need for a cancellation. Our cancellation policy allows you to cancel your entire order without any penalty if no payment has yet been made and no tree has yet to be created. Once the tree is paid for we immediately begin working on the order. At this point, if you choose to cancel, email us with your reason of cancellation, you will forfeit the design fee but everything else will be refunded. If a tree sample has been emailed and approved, or shipped, we cannot refund your order, but will work with you to resolve any issues you might have. We're not happy till you're happy! We do our best to ship the prints in such a way to protect them during the shipping process, but occasionally the US Postal Service damages the box they are shipped in causing damage inside. If something should happen to the packaging during the shipping process, we ask that you take photos of the damage to the box and the print(s). Email them to makemybranches@gmail.com and we will do our best to work with you to replace the damaged prints with new ones. Subject to USPS insurance policies. No problem, just send us an email and we'll get one sent out. Check the pricing page for the exact cost. Making changes is a fairly simple process. Click here to fill out the Update Order Form with the desired changes. You need to pay the new invoice and await the new updated sample for approval.